Realtime information in a constantly fluctuating a real estate market. To properly guide a customer’s journey through the buying or selling process, a quick access to the changes in real estate market values is the key to success for any real estate agent. 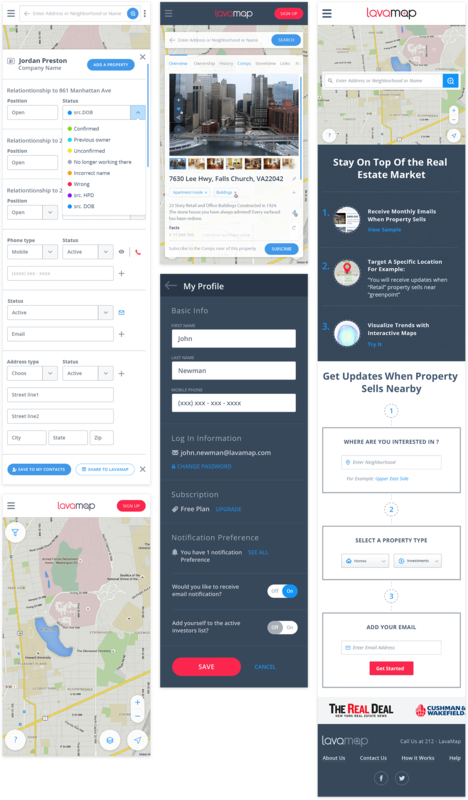 With the system we built for Lava Map, it is now simple for real estate professionals to track any vital information and stay on top of the market, while also taking advantage of the customized alerts and access to the sophisticated online search. Ask any real estate agent what is the most important tool in their activity and they will answer that is their mobile device. We knew this was a key factor in our development process and just creating a solid responsive design for LavaMap was not going to be good enough. We had to create a mobile environment that was as good or even better than the desktop environment. UI design hinges on an authentic understanding of your audience, which is something we take very seriously at FuseLab. 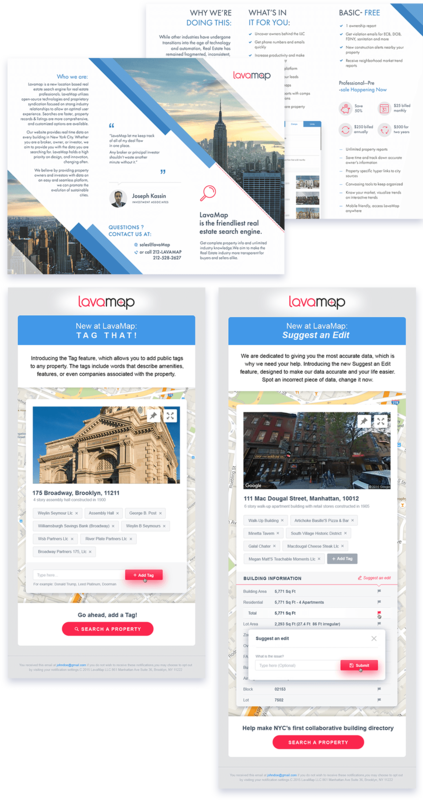 The interface for LavaMap visually illustrates and makes it obvious to real estate agents how to easily get to their needed research criteria, how to access quickly critical information – and all this without any guesswork or difficulty. To be truly effective, communications today have to include some kind of video segment. Video has become part of our shopping process, even for the most mundane purchases. In the case of real estate sales video is paramount. This fact was not overlooked while working for LavaMap, the objective was to attract even the realtors in one of the most expensive and cut-throat markets on Earth: New York City. Mobile design for a real estate agent that is constantly on the go, is about as important as it for an Uber driver. Real estate agents live on their phones, often even viewing contracts on their phones. With the system we built for LavaMap vital information is delivered in real time, with easily digested nuggets of market analysis, with filtered information always just a few touches away. Our illustrations and iconography developed for this site makes navigation intuitive and simple, regardless if you are a new realtor or a seasoned veteran. The artwork also helped to brand the company in a new and fresh way, setting it apart from the competition. Real estate agents love to meet in person; their daily work often involves driving their clients around in their own car and getting to know new people on a personal level. 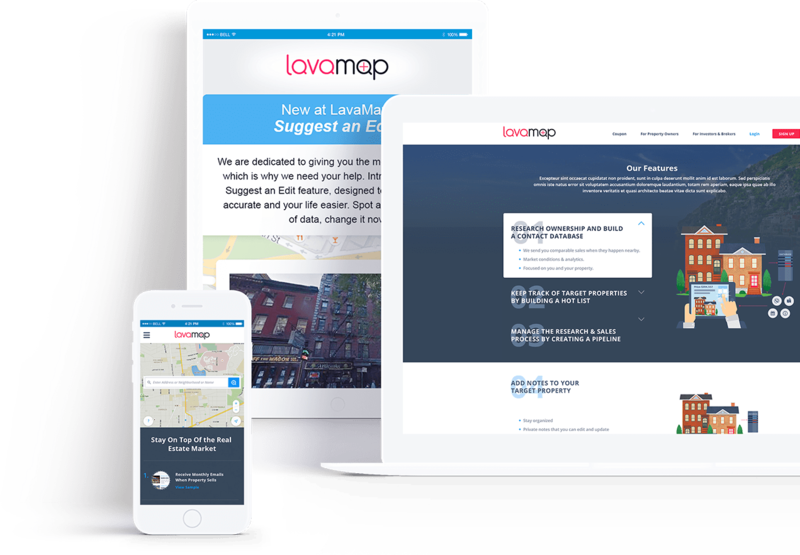 LavaMap anticipated this and made it easy through the built in application services to reach out to potential clients. The keys to style for Lava map were built around a fluid transition of buttons and functionality between desktop and mobile; parsing capabilities makes it easy to quickly scan the information using touch or mouse. 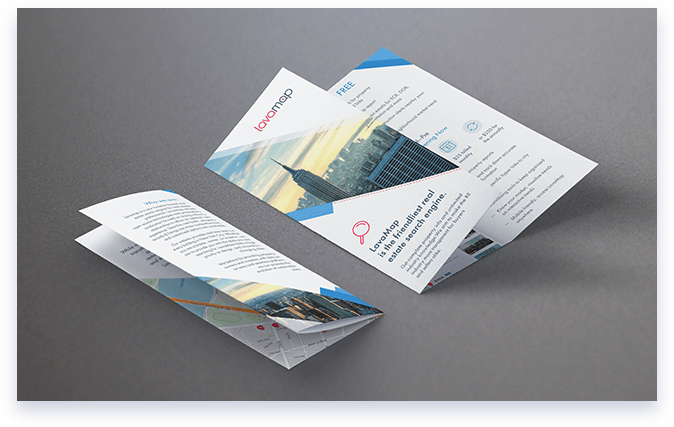 High contrast colors, bold fonts juxtaposed with simple serif fonts, and an obvious visual hierarchy, created a truly simple and enjoyable experience for agents in the New York region.